Krystie completed her education at the University of British Columbia, obtaining a Bachelor’s degree in Human Kinetics prior to achieving her Masters of Physical Therapy. She is a distinguished academic – publishing articles in the North American Journal of Sports Physical Therapy and Respiratory Physiology and Neurobiology. Krystie is also a Fellow of the Canadian Academy of Manipulative Physiotherapy – an internationally recognized qualification in hands-on manual and manipulative therapy. To offer better care for her patients, Krystie places a strong emphasis on post-graduate education. 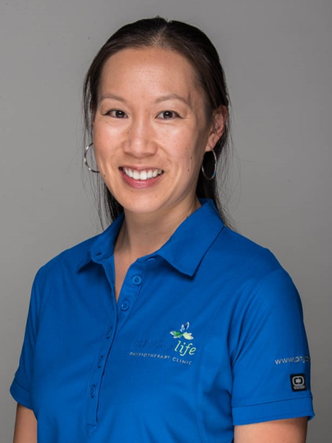 She is certified to perform acupuncture and Gunn IMS (intramuscular stimulation), and has completed FITforeGOLF – a physiotherapy specific program for golf-related injuries. Krystie’s broad range of clinical experience includes sports injuries, orthopaedics, arthritis, osteoporosis, pre/post-surgical rehabilitation, work-related injuries, and injuries sustained in motor vehicle accidents. Her sport involvement includes 6 years with UBC Women’s Basketball, during which time the team won three National Championships. Following her involvement with UBC, Krystie worked with the Surrey Eagles Junior ‘A’ Hockey team for 4 seasons. Krystie was named the Physiotherapy Chair for the 2012 BC Summer Games and has worked on medical teams at various events including the World Police and Fire Games, the Women’s National U18 Hockey Championships, and the Canadian Track and Field Championships. Krystie also volunteers with the Earl Marriott Secondary Football team. When not in the clinic, Krystie enjoys spending time with her family. Her other favourite activities include horseback riding, running, weight lifting, hiking, yoga, snowboarding, and golf.